What’s the big deal about GM pay? Excessive executive compensation is a huge trigger for lots of SCA owners. Unfortunately, the Board and GM have taken the tact that they can do whatever they want and they don’t have to answer to anyone. it’s okay to threaten owners with legal action if the pay is disclosed to third parties. What training should the Board have taken? If the Board had taken the NRED training, Responsibilities of the Manager,they might have learned that they should have, at least, had a written agreement defining ALL the terms and conditions for the GM’s employment, including compensation, as required by NAC 116A.325 and by her Community Association Manager (CAM) license. Why no GM management agreement? Probably because NRS 116.31085(2) PROHIBITS the Board from adopting or amending ANY contract in secret. Or maybe because the Board “work group” who negotiated the GM’s terms and conditions of employment didn’t have the right expertise. In 2014 SCA had a fine management agreement with FSR. It is a mystery why the 2015-16 Board would think they could just “wing it” with a handshake deal the first time SCA was flying without a management company’s net. Isn’t a written agreement required just when contracting with a management company? No. A written agreement is needed whenever an association pays a licensed community association manager (CAM) for management services. Whenever management services are paid, the manager must be licensed. The only exception is when the association is small, and the board is able to manage the property by itself without paying a licensed professional manager. Besides, how can owners be protected if a community manager licensee does not have to meet the requirements of the CAM license just because he or she is an employee of an association as opposed to being the employee of a management company or being an independent contractor? How does NRED exercise its authority over HOA managers? NRED regulates ALL community association managers in Nevada through “licensure, registration, education, and enforcement”. NRED states there is no legal prohibition against an association handling its own affairs if it does not need to hire/contract with a professional, licensed manager. Any HOA board can control its business directly without paying a licensed managing agent. The law ONLY requires that the manager must be a licensed CAM, and subject to all the regulations of the community association manager license, if the manager is COMPENSATED. Which duties don’t require a CAM license? NRED has published a list of the specific duties that can be performed by UNLICENSED employees. This means that it is unlawful to COMPENSATE any individual manager, or any management company, to perform the higher level CAM duties unless all the requirements of a CAM license are met. The duties performed by the SCA GM require a community association manager license. The CAM license is required unless those duties are performed by a volunteer who receives NO compensation. SCA bylaws 3.13, 3.18, and 3.20 define, and limit, the Board’s authority to employ and compensate a LICENSED CAM to manage the association. Section 3.20 gives the Board the authority to provide compensation to a manager, and specifies limits on what the Board can delegate to the manager. 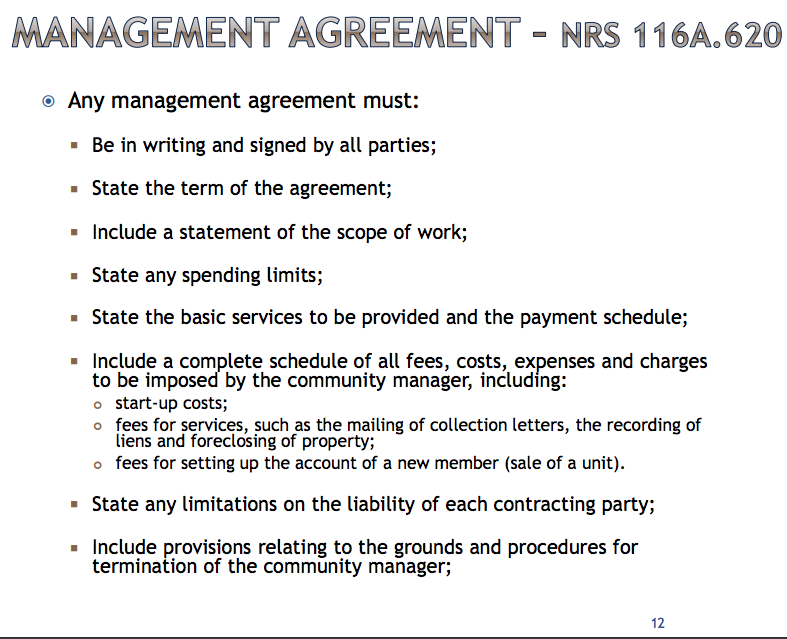 Section 3.13 (f) says compensation to a community manager must be under the terms of a management agreement. 3.13 (a) prohibits compensation that creates an appearance of undue influence or a conflict of interest. Doesn’t it seem that paying the GM double the market rate, as well as paying a second licensed CAM the full market rate, created a huge, ACTUAL conflict of interest? Ultimately, it is the Board’s job to protect owners from being taken advantage of by licensed professional agents. If the Board does not do this critical job, then it is up to NRED to enforce NRS 116 requirements on the Board and the enforce the provisions of the CAM license on the GM. NRED has no authority over the attorney because the attorney has ZERO decision-making authority over the association despite how it may appear. The recent response article written by David Berman was so ridiculous, that I still can’t stop laughing. Of course no surplus would have existed if the dues hadn’t increased, adding $700,000 in revenue. In fact, when that’s factored into the equation, a LOSS would have taken place. Once a free spending wasteful bureaucrat, always a free spending wasteful bureaucrat. They are what they are, and are the laugh of those in real business world. Comparing “efficient” government incomes and benefits, to Sun City Anthem’s management compensation levels is like the Pentagon buying toilets for $800, and SCA buying one for $500. A bureaucrat would believe that we got a bargain, while an intelligent person who would buy it for $200, would look at both, and say WASTE is WASTE ! …it was someone else’s money that paid for it ! The very thought of questioning the $200 purchase would be foreign to his thinking. After all, “the system” told him it was the”right price”…and those who need that “system” to define them as a human being, accept that stupidity as fact because that’s what “the system” said ! Nothing like the credibility of a person who has failed in everything he’s ever done. He’s the guy on the street who stops you, rolls up his sleeve, and shows you his Rolex watches he wants to sell you for $10. The only experience he’s ever had with money, is losing it. I have also read the David Berman comment(s) – the SCA Minister of Propaganda strikes again……..Josef Goebbels would be proud! Previous Previous post: What is the maximum the SCA Board can pay the GM?